The summer before Kelly was born, Sue and I visited Westwood Memorial Park in LA, right near UCLA. 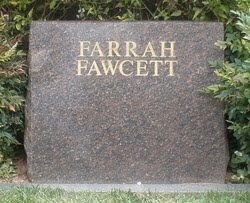 They've apparently expanded it a bit, and now Farrah Fawcett is buried there, in a beautiful new section of the park. It's a great little cemetery to visit. Marilyn Monroe, Truman Capote, Minnie Riperton, Natalie Wood, Liz Taylor's parents, Carroll O'Connor, Peggy Lee, Dominique Dunne, Walter Matthau, Brian Keith, Dean Martin ... so many famous names rest there. If you go, print out this map and take it along, because otherwise you will be wandering around cluelessly. I got at least one angry e-mail when I wrote about the visit, but too bad. I love cemeteries and am always respectful.